Revamping our Educational System: Why It is A Necessity. Today marks the beginning of the final term in the 2015/2016 academic year. After nine months of rigorous activity, many are just counting the days from now to the closing bells which will keep our schools closed for three or more months. I saw this picture online and since then, I have been thinking a lot. 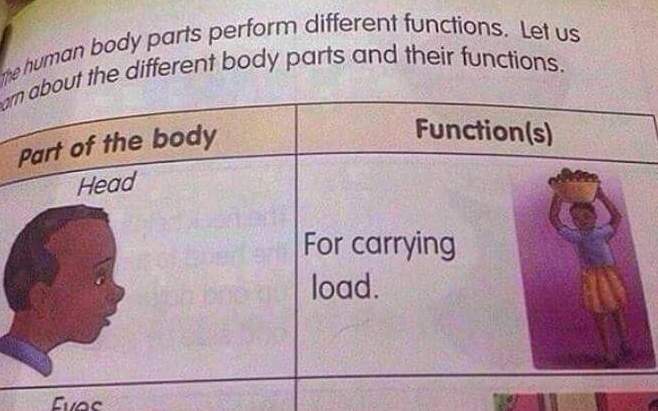 What really are our children learning these days in school? How does what they learn help shape their lives and thought process into adulthood? Imagine a picture like this saying the function of the head is to carry loads? What lessons does such an image send to the children? Why not say the head is used to think out solutions to problems? Encourage creativity and critical thinking? Too many questions I know and the more I come across pictures like this, the more I have been thinking about the kind of education we receive. A barrage of primary and secondary school memories came flooding as I looked at this picture in dismay. I couldn’t help thinking while we were being made to recite the ‘2×1 ah two’ to ‘2×10 ah tweeeenty’, kids in the West especially were being taught how to use mathematical equations to solve complex problems in life. While we were being told ‘A’ stands for Apple, Kids in the West were being told ‘A’ stands for Astronaut. While we were told ‘D’ stands for dolls, they were told ‘D’ stands for Doctors. They were being trained to use their power of reason to be innovative, to dream big, we were made to think only within the four walls of the class room, to pass an exam and go to the next class. In secondary school, nothing changed much. While kids were taught about the speed and dynamics of light for example in a physics class and how understanding such was crucial to a lot of scientific discoveries, we were being taught to define light which a class mate defined it as ‘something that makes wang, wang and loss’ you know, trying to mimic how a fluorescent light comes on. This may have been dismissed as a naive form one student who is still to get the grip on the exciting fact that she is now in college. One could think with Cameroon’s record of having one of the highest literacy rate in Africa, such answers could be things of the past; then you get this rude awakening when a recent university student defines Gender Equality as I quote ‘ when a pregnant woman gives birth to twins, a boy and a girl’. This is the reality. Either students do not care much about school or the teachers are not doing their job well and especially, thepowers that be are just leaving things to chance when it comes to creating school curriculum. It is ironic that kids are probably still being taught what I and my generation learnt many years ago. The Mungo Parks, Vasco Da Gamas and Christopher Colombus supposed voyages of discovery instead of the heroic achievements of our ancestors. One wonders how these lessons equip kids to be innovative and creative problem solvers and change makers especially in an era when a lot of social ills and diseases continue to plaque our continent. There is an urgent need for a revamping of the educational system if we want to see progressive and solution seeking youths. Some of us were fortunate to have parents and mentors who helped us think out the box and school curriculum, parents who helped us understand learning doesn’t end within the four walls of a classroom. Parents who dared us to dream. Many today do not have that. They pass through school but school doesn’t pass through them because they are there for just one purpose… pass their exam and go to the next class. For our kids to be innovative and critical thinkers, they need to be educated right. Therefore, a revamping of the educational system will go a long way towards building a progressive, innovative and socio- economic and vibrant country. I salute the educators who have noticed this gap and are daring their students to be innovative and critical thinkers. Prev SICKLE CELL CRISES: Understanding what it is all about and Identifying Possible Trigger Factors 2: MENSTRUAL CRAMPS. Next Why Dancing in the Rains Is a Warrior’s Shortest Cut to the Battlefield.